OK, this is my last Illinois review for….two weeks. Finally, after a week back in Illinois for a family emergency and then work, I was heading back to Lansing. I like my family and miss them a lot, but I was really, really ready to get back to Michigan. J and I had been watching the radar for the last two days wondering if I was even going to make. It never fails, if we have to drive through southwest Michigan and Northwest Indiana, it’s guaranteed to snow. Guaranteed. Today didn’t look much better, but I decided to chance, so after a quick phone call to J to let her know I was on the way, I packed up my truck and headed north. I left my parents right around 11:30 and sort of ran out in a hurry wanting to be on the road in between snow storms, so I didn’t get lunch with them. I was on the road about an hour when I started to get hungry. I knew I was coming up on the Lincoln Oasis, so I decided just to wait. For those of you that aren’t regulars on the toll roads, the Oases are stops along the toll road where you don’t actually get off the highway, so you don’t have to pay to get off and get back on. On I-294 (the Tri-State tollway), the Oases are suspended over the road. 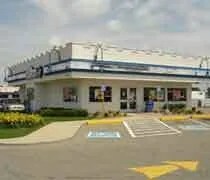 In other places, they usually look more like rest stops with gas stations off on either side of the road, but around Chicago, there’s not much room, so they built a parking lot on either side then built the actual building across. 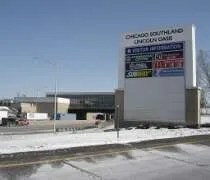 We used to stop at one of the other Oasis’s near O’Hare when we went to shows at The Rosemont Horizon (later called Allstate Arena). 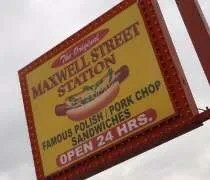 They always have some sort of fast food. Some have Wendy’s. Some have McDonald’s. This one has McDonald’s. 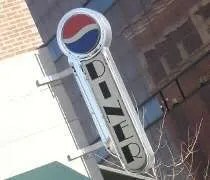 I have got this strange fascination with 24 hour diners. When we go to my girlfriend’s parents house, we leave Lansing when she gets off work around midnight. That puts us in the Chicago area around 2:00 AM CST. This night was no different. We made it to town just after 2:00. Like the lazy college kids we aren’t, we piled all of our dirty clothes into her car and took over her parents laundry room. Because we had plans Saturday afternoon, J wanted to get a couple loads done before we went to bed. We put in a load of whites and realized we were both hungry. 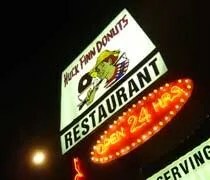 Even though Huck Finn has been there since she was in high school, she never ate there. Since it’s only a few blocks away, we hoped back in the car and went for breakfast. 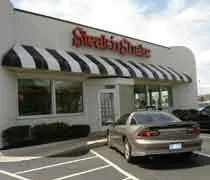 Steak ‘N Shake – Edgedwood Blvd.